Born in a family of five, with two siblings a brother and sister, Aaron's ear for music was spotted while still a toddler. At three years of age he was already rhythmically drumming using everything in sight - small wonder the first instrument he picked up was the drum set. He attended the Lavington Primary School then the prestigious Nairobi School for his secondary education. Though he claims little if any musical pedigree in his family, his younger brother, Tim 'Ennovator' Rimbui happens to be one of the country's premier producers. Exuberant after just completing his primary education and on only his second week of post-primary vacation, Aaron survived a horrific domestic accident. One of his neighbours had accidentally left a gas cooker on, and while trying to switch it off, a serious gas explosion occurred. Aaron, in a moment of retrospection, recalls being awake through the whole experience and was diagnosed with second degree burns. He spent the next month bedridden at the Nairobi Hospital, kicking off an extremely difficult, yet immensely profound and life-changing period of his life. For the next 18 months he was in and out of hospitals, seeing different specialists due to the complications that arose after the accident. He developed chiloids and had to undergo reconstructive surgery. After numerous visits to theatres for surgery, he found himself earnestly seeking for God's presence to abide with him during this telling period. As his search continued, and his heart reached out for the Lord, he suddenly got baptised in the Holy Spirit while praying. Aaron 'Krucial Keys' Rimbui started playing the drums in 1990 when his father bought him a 4 piece drum-set. After assembling it, he proceeded to carry it to church, and it was not long before he was declared the official church drummer. Prior to his accident he had attended two months worth of piano lessons, but painfully, his fingers were unable to play the keys. While still at Nairobi School he met up with Daniel Mwiti, now of Milele, who mentored him musically and over time he began to blossom as a pianist. At the same time he rubbed shoulders with the school's other talented pianists Chris Adwar and Jacob Asiyo, now of the Hotel Intercontinental. Little did he know that his career in music would be greatly influenced by his attendance of an overnight prayer meeting at the Nairobi Baptist Church . There, he came across two exceptionally gifted guitar players, J.J Ojiambo and Kung'u Mbathi (of Four Winds). Aaron later joined the I.B program at St. Mary's, and on his very first day there, while attending auditions for the annual school musical, he comes across the very same guitarists playing in the band. This began a budding music relationship and after a few months of playing together they formed the band Jazz It All; members being Aaron, Kung'u, JJ and now-producer Gideon Kimanzi. 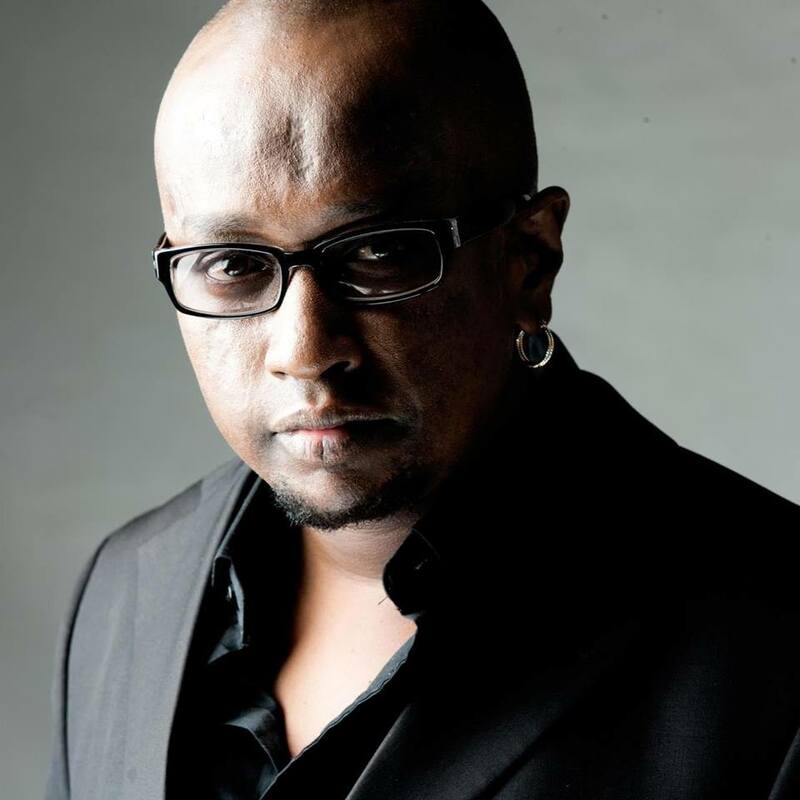 In 2000, Aaron secured an internship at Bruce Odhiambo's Johari Clef Studio and embarked on a journey as a producer. He confesses that being thrust smack into the middle of the secular music industry was a testing period as regards his Christian witness, where he often worked with people who had little or no concerns about his Christian convictions. He recalls rejecting offers to do cigarette advertisements amidst great pressure to do so. Later that year he had an unsuccessful application for the Youth For Christ USA tour. He proceeded to join Pete Odera 's 'Beyond the Veil' album tour. But when the YFC designate pianist Chris Adwar was taken ill, the band suddenly needed a pianist. Fortunately for him, the 2001 YFC USA tour proceeded with him. After touring 8 states and performing at over 600 concerts, he recalls the pressure of it all almost having him contemplating quitting and just coming straight back home. In hindsight he is extremely glad he stayed along, gaining invaluable ministry and performance experience. On completion of the YFC tour he went back to Johari Clef Studio and was also incorporated into the Nairobi Baptist Church worship team. One afternoon while on a worship team practise session, team member Kavila Matu approached Aaron with the idea of meeting up with a friend of his who had just returned from studying music at the prestigious Berkeley College in the U.S. He got to meet Kavutha Mwanzia, a highly gifted jazz vocalist, and immediately they struck up a music relationship. Soon thereafter, the Four Winds Band was formed. Aaron has since been privileged to work in the Sterling Q musical productions Ipitombi and Luanda Magere. He has also toured with seasoned veteran Eric Wainaina, starting off as a pianist and eventually maturing into Eric's music director. For a full year he served as Eric's music director, pianist for Four Winds and band member for his local church, before the juggling became too much for him to handle, prompting him to resign as Eric's band leader. Today Krucial Keys is a highly sort after musician, and has played for the likes of Wyre, Suzanne Owiyo, the Kibukosya's and Kanjii's Villagers Band. An ostensibly talented producer, he is totally sold out to his craft, having produced for the 2005 KORA award winning DNG, as well as artists such as Hellon, on the region's first ever African Jazz Saxophone album, and Chizi on his splendid debut album Suluwe. He proceeded to conceptualise his very own piano jazz concert, and as one thing led to another, the idea morphed into theaaron rimbui recording of his very own debut album 'Keys of life ' an exceptional jazz album with elements of world music and a tinge of benga-fusion. Having incorporated noted vocalists Eric Wainaina and Mercy Myra, Aaron proceeded to craft one of the standout albums of the year 2005. On his inclusion of mainstream artistes in his Keys of Life project he quips: 'They are always willing to include us in what they are doing and how will they experience Jesus if we don't include them in what we are doing' Without hesitation he confesses bible reading and prayer are an integral part of his daily walk with the Lord. Aaron was part and parcel of the Kijiji Records inception in 2005, and after initial talks with Kanjii, who was in the U.S, their dream of working together in production begun to finally take shape. Today Aaron works full-time at the Kijiji Records studio, affectionately dubbed The Village. He is also a worship team member at the Nairobi Chapel Mavuno assembly; all the while still playing with his Four Winds Band. Aaron has experienced the seriousness and professionalism secular artistes put into their performances and endeavours to achieve a higher artistic level of worship music and challenge other worship teams to pursue excellence.